MAKES 5 SERVINGS PREP TIME: 25 minutes ​COOK TIME: 3 minutes. This breakfast bowl delivers a well-balanced meal with four food groups. 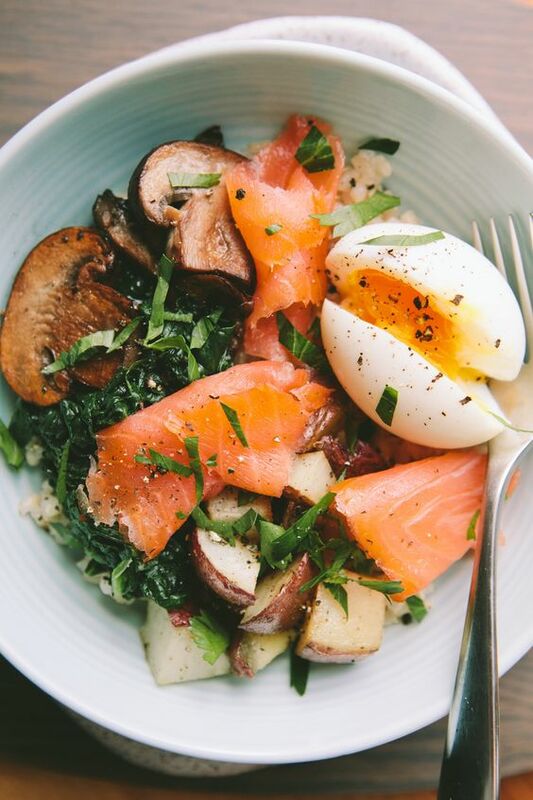 No-fuss smoked salmon is packed with protein and omega-3 fats, while the cheese provides protein and calcium, and the eggs contain protein and lutein, which is good for eye health. If that’s not enough, the whole-grain crackers provide fiber, and the vegetables offer antioxidants and phytonutrients, natural plant chemicals. 5 large eggs.5 ounces smoked salmon, divided into 1-inch-thick pieces 5 teaspoons capers, drained 1 lemon, cut into 10 half-moons 5 ounces Monterey Jack or Cheddar cheese, cut into 1-ounce pieces 4 plum tomatoes, sliced 4 Kirby or Persian cucumbers, sliced 2 red bell peppers, sliced 20 whole-grain crackers. 1.Hard-boil the eggs by placing them in a medium pot and covering them with water. Over high heat, bring the water to a boil. Cook the eggs for 3 minutes, then remove the pot from the heat, cover, and let stand for 15 minutes. Drain the water and place the eggs in a bowl of ice until completely cool, about 10 minutes. Peel the eggs and slice lengthwise. 2.Into each of 5 containers, place 1 piece of smoked salmon, and top with 1 teaspoon of capers and 2 slices of lemon. Next, place 1 ounce of cheese, 1 egg slice, and even amounts of tomatoes, cucumbers, and peppers on the side of the salmon. Add 4 crackers next to the cheese. Storage: Place airtight containers in the refrigerator for up to 5 days.